Internet freedom needs a global network behind it. fightforthefuture.org has launched The Internet Defense League. Now you can defend the net by broadcasting action messages on your own sites using this widget. 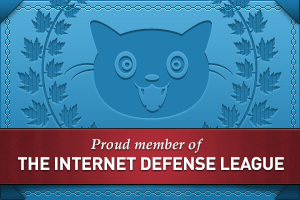 You can also tell the world that you are a member of the league by displaying one of the IDL badges hosted by internetdefenseleague.org. I released the new scan engine in version 1.2.10.05 today. This is the scan process that I’ve had available as a BETA for a couple months but it was not ready for release until now. It take longer because it breaks the scan into smaller processes that complete independently of the scan initiation process. This has a better success rate (especially on server with lots of files or minimal memory) and allows for better error handling. Quick Scan – Good for small file systems, fast servers, or sites that have post restriction. Complete Scan – Good for large file systems, servers with irregular permission issues, or low memory allocation. The Automatic Fix process and File Viewer have been improved too. It loads nicer now and you can move this new pop-up window around on the page :-). Please give me feedback on these new features and scan options.